Blog: Food safety is a weighty subject, a discipline that uses special guidelines to protect hungry consumers from food gone bad. The subject covers everything in the food and beverage industry, including that all-important matter of storage. Cool rooms are a particularly important part of this scenario, as this is where food is kept fresh, stored until the edible goodies are called forth for consumption. Food spoils when it gets warm. At best, this means a product will become so warm that it doesn’t taste good. At worst, the stored foodstuff becomes dangerous to eat due to a build-up of bacteria, microbes that flourish on food when the temperature rises above 5˚C. Cool rooms take care of the first issue, keeping the merchandise fresh, cold, and flavourful. Imagine a beer or wine storage area, a cooling space that’s formed from insulated panels and sealed doors. A low-power refrigeration unit drops the temperature, but it’s still comfortable enough to walk into the room for limited periods, although the chill will send a biting tingle down your spine. 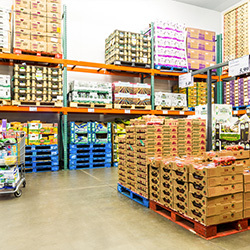 Perishable products are maintained at an ideal temperature inside this sealed room, thus extending shelf life. You’ll see cool rooms whenever you’re out shopping for food or a cold beverage. The wine or beer cabinetry in the local market is a cool room. They’re employed as handling and preparation stations within hotel and restaurant kitchens, keeping the food fresh until the cooking begins. Large wineries use the enclosed chambers to preserve the heady flavour of a new wine, keeping the alcoholic beverage at just the right temperature for a taste session. Next, you can add a bouquet of flowers to the bottle of wine, because florists rely on walk-in coolers when they finish an arrangement or even just to stock new batches of plant-stuff. The room is typically glass-enclosed to put floral arrangements on display, but this same glassy outline is just as popular within supermarkets, seen within beer-filled cabinets and their steel-lined shelves. Take a closer look at these cabinets next time you feel thirsty. The shelves actually open up in the back to reveal man-sized storage rooms. Designed to fill more than a high-end chilling role, these rooms are outfitted with many exceptional extras. Multiple tier shelves hold tubs and crates of food. Sliding or hinged doors incorporate product-specific features, such as the easy loading of heavy barrels of beer. Digital controls ensure the temperature stays well within that critical 0˚C to 5˚C temperature range, thus storing the food at its ideal freshness point. Regular cleaning of cool rooms in necessary in order to control contaminants and protect food form damage. Until now, cool rooms have required servicing every 3 to 6 months. Coolclean has partnered with Aeris Environmental, whose quality products not only clean but disinfect cooling assets, and extending service intervals to 12 months. Instead of simply “moving the problem to another area”, Aeris leads the world in the removal of microbial contamination (biofilm, mould and bacteria), reducing the load on assets and protecting them from recontamination.